About a month ago, Eddy Flux came to the Hopland Research & Extension Center ... and is here to stay. Who is Eddy Flux you might ask? Wrong! Eddy flux, or eddy covariance, is a key atmospheric measurement technique. This methodology measures and calculates vertical turbulent fluxes within atmospheric boundary layers ... and analyzes high-frequency wind and scalar atmospheric data. This technique is used extensively for verification and tuning of global climate models, weather models, and complex biogeochemical models. The eddy flux method can be used to track greenhouse gas emissions, monitor carbon dioxide and methane emissions, and to track evapotranspiration. For more information go here. Eddy flux towers are being installed at all of the UC ANR Research and Extension Centers in order to monitor environmental conditions statewide. 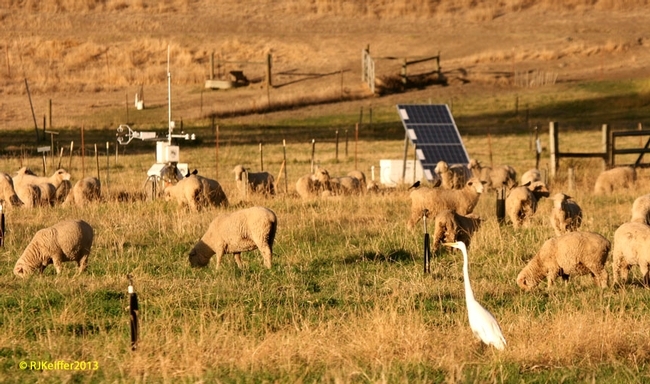 Here you see the solar-energized eddy flux tower at HREC, being admired by a few sheep and a great egret.